Bride applies lipstick at Barker Mansion in Michigan City, Indiana. 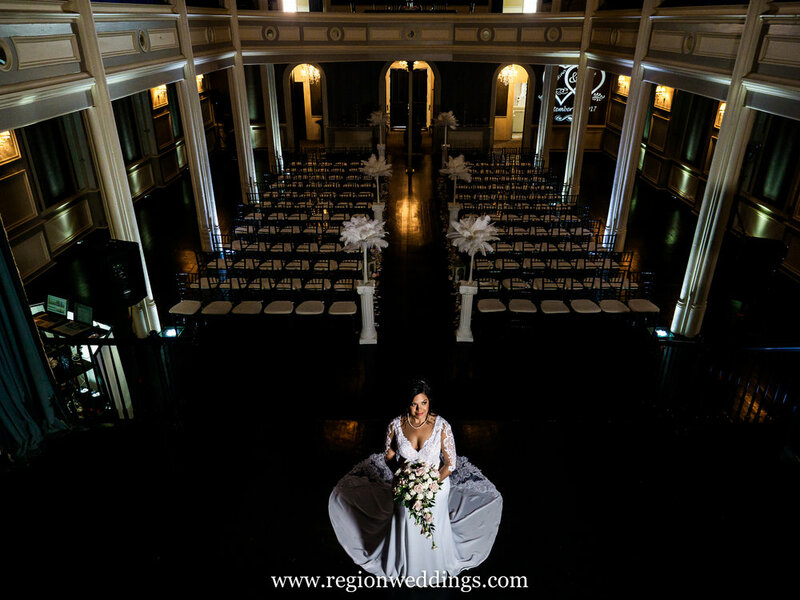 Welcome once again to the Region Weddings Year In Review for wedding photography in Northwest Indiana, Chicago and southern Michigan. Settle in as it was another full year of weddings and this my longest article of the year with lots of images. To see a video slideshow of this post, check out The 2017 Year In Review video. The 2017 wedding season saw me photograph for the first time at the historic Barker Mansion in Michigan City. My goal with this series of bridal portraits was to showcase the vintage history of the iconic building with a very modern bride. This resulted in some glorious color right next to sepia tones. Bridal portraits at Barker Mansion. Bride on red staircase at Barker Mansion in Michigan City, IN. There were quite a few winter wedding this year starting with Annie and Paul at Fair Oaks Farmhouse and then Lynne and Dale with a church ceremony at a stop at One Trick Pony brewery. Samantha and Dale were married at Saint Maria Goretti Church with a very chilly stop by Centennial Park. As winter gave way to Spring (very begrudgingly), Sam and Alex and Amanda and Mike were on board for a pair of church weddings along with stops at Buckley Homestead. Spring wedding photos in Northwest Indiana. Bride and groom strike a magazine style pose at Centennial Park. Late summer and early Spring saw Emily and Zach with an outdoor ceremony at Villa Cesare and Amanda and Josh at St. Michael's Church. High fives, neon love, sisters / bridesmaids and church wedding ceremonies. Summer weddings saw the flowers of Northwest Indiana in full bloom at Hans and Karla's outdoor ceremony at The Inn At Aberdeen with lakeside photos for Jill and Johnny. July wedding photos in Northwest Indiana. Bride and groom kiss in front of the old Crown Point Courthouse. 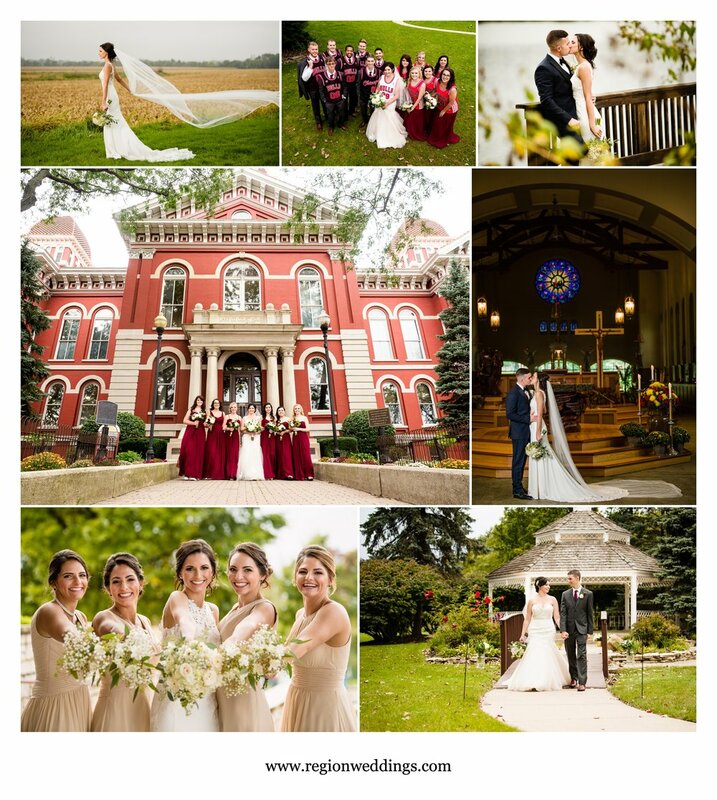 Ashlee and Ryan took a tour of downtown Crown Point for their wedding photos while Samantha and Tyler stayed in Valparaiso for their Aberdeen Chapel ceremony with pictures at Taltree Arboretum and a reception at The Market. August weddings in Crown Point and Valparaiso. Post ceremony kiss at The Chapel at Aberdeen Manor. 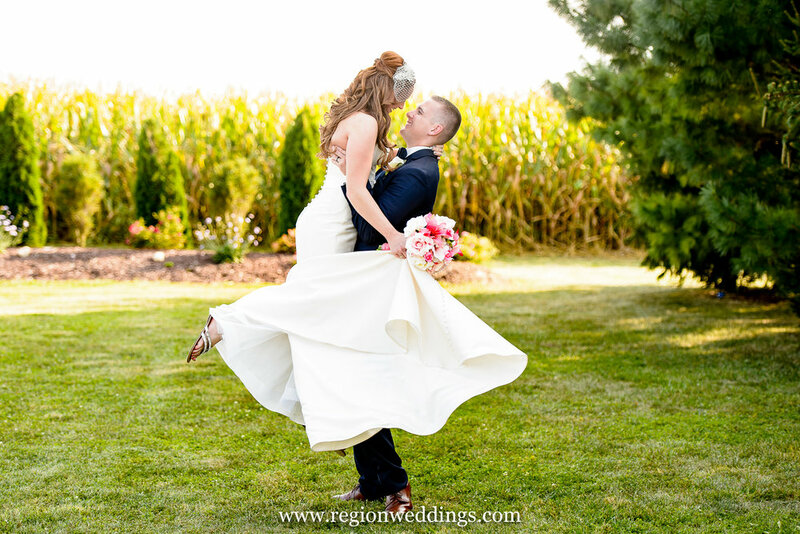 The groom spins his bride near the cornfields of Indiana. Late summer say another new venue, Meadow Springs Manor with Karlie and Corey and a spectacular day at The Pavilion At Sandy Pines with Bethany and Keenin and their classic Mustang. 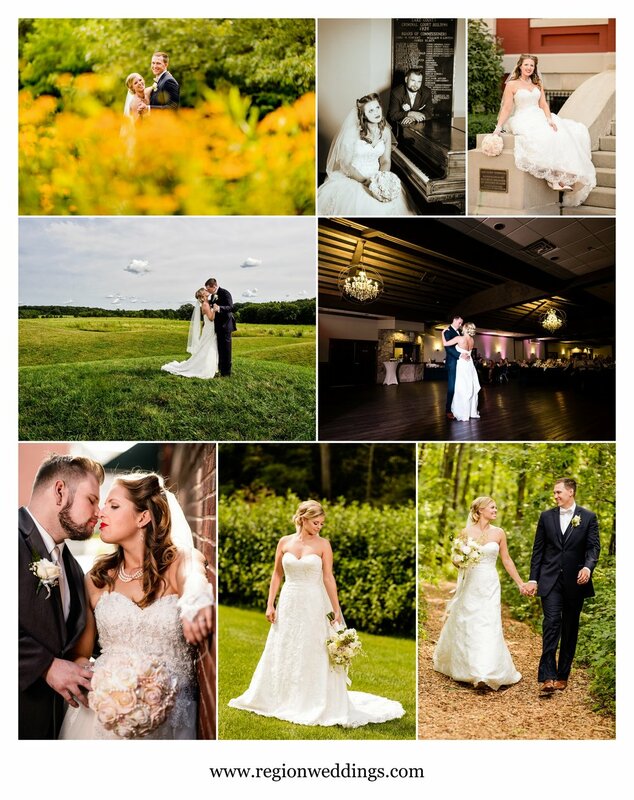 Late summer weddings at Meadow Springs Manor and Sandy Pines. Bride and groom ride away in a classic Mustang. September and October were definitely the busiest for weddings as well as engagement sessions. This part of the season saw Christina and Melvin at the incredible Uptown Center and Emily and Todd who were married at the final event at the bride's (soon to be torn down) childhood church next to her parent's home. Bride on stage at The Uptown Center in Michigan City. 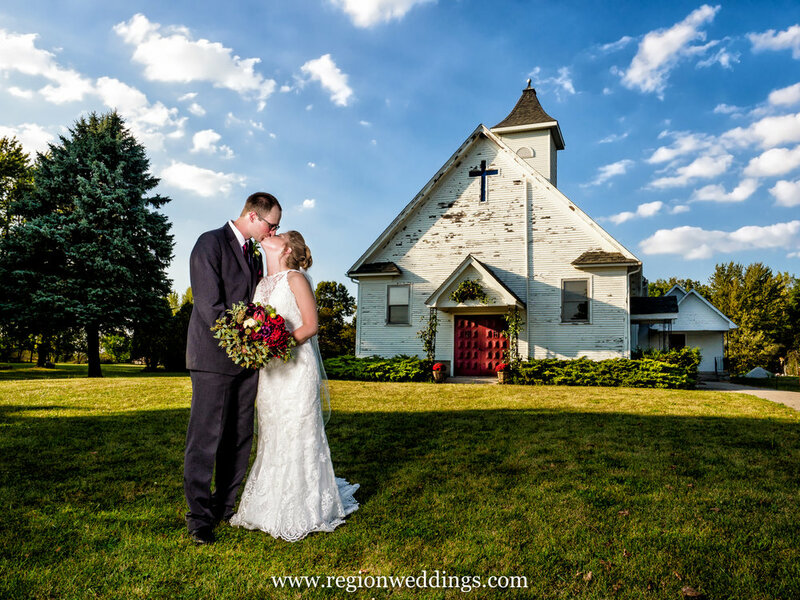 Bride and groom kiss in front an old chapel in Hebron, Indiana. Romantic wedding photo in downtown Michigan City. 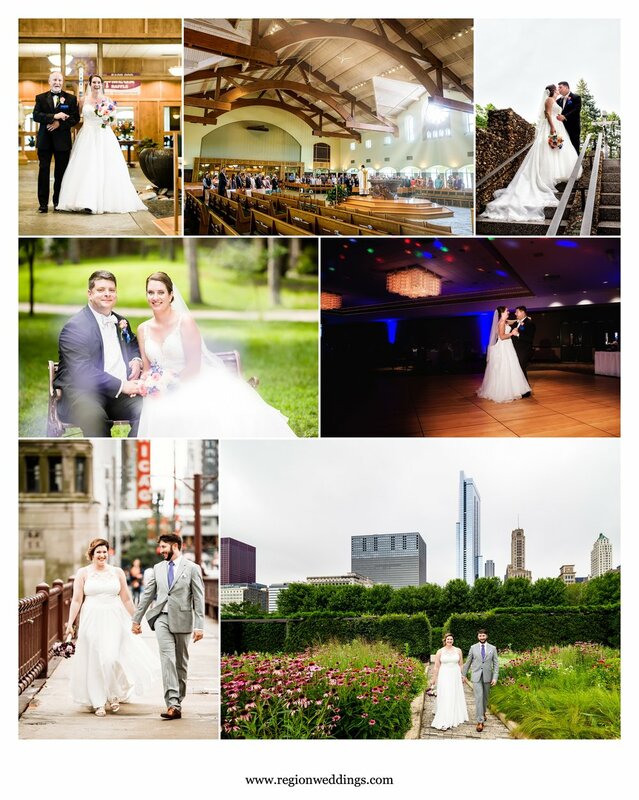 I photographed two Serbian weddings in 2017 with Jessica and Marinko at St. Simeon Church in Chicago and Tanja and Kevin at St. George in Schererville. The circle dances never stopped on either day. Serbian weddings in Chicago and Schererville, Indiana. The sun sets as the bride and groom gaze at each other beneath the tall trees in the forest. As Fall kicked in, I photographed two weddings on opposite ends of the region both in style and geography - Katie and Mike at Lighthouse Restaurant with it's nautical vibe and The Allure in South Bend with Morganne and Chris. Fall weddings at Lighthouse Restaurant and The Allure. Bride and groom on the pier at Lighthouse Restaurant. Bride and groom on a leaf filled bridge near Coffee Creek in Chesterton, Indiana. The Autumn weddings also saw stops at Sand Creek Country Club with Jessica and Mitchell and The Spa in Porter, Indiana with Julia and Evan. Both weddings featured a deluge of leaves and Fall color. Autumn leaves at wedding venues Sand Creek Country Club and The Spa. The bride and groom share a kiss surrounded by Fall color at The Inn At Aberdeen. 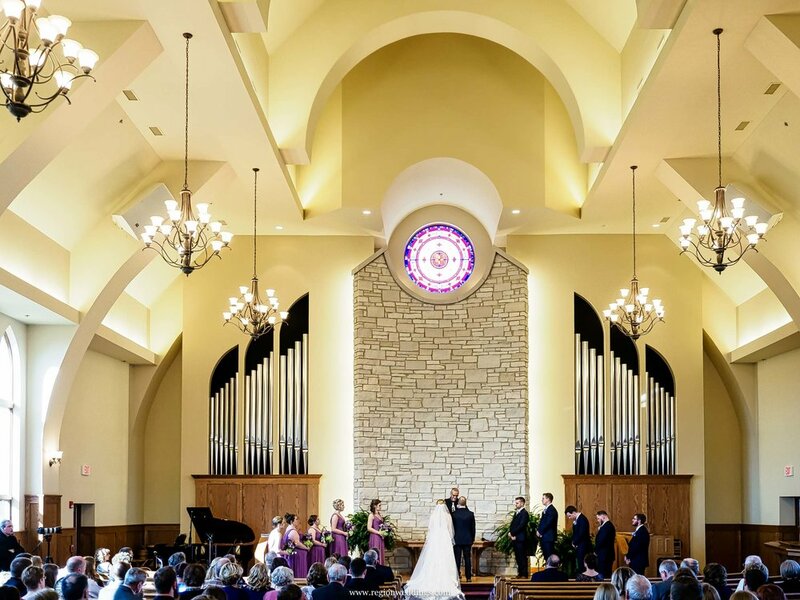 November saw a pair of church weddings with Gina and Marcus at The Chapel At Avalon Manor and Emily and Jeff at Holy Name Catholic Church and reception at The Center For Performing Arts. Both had an abundance of unique Fall colors. Bride in mirror before walking down the aisle. I certainly can't forget Jeremiah and Kevin with their big Christmas wedding at The Uptown Center or Whinchester and Whinchester (aka Jennifer and David) - my first ever bride and groom with the same last name. Christmas red and a bride and groom in blue. Thank you so much for a terrific 2017 in weddings!! I have one more on December 30th so be sure to stay tuned here for the final wedding of 2017. To inquire about your big day, as always please complete the Contact Form. I hope you have a terrific New Year and let's hope for a 2018 filled with love. 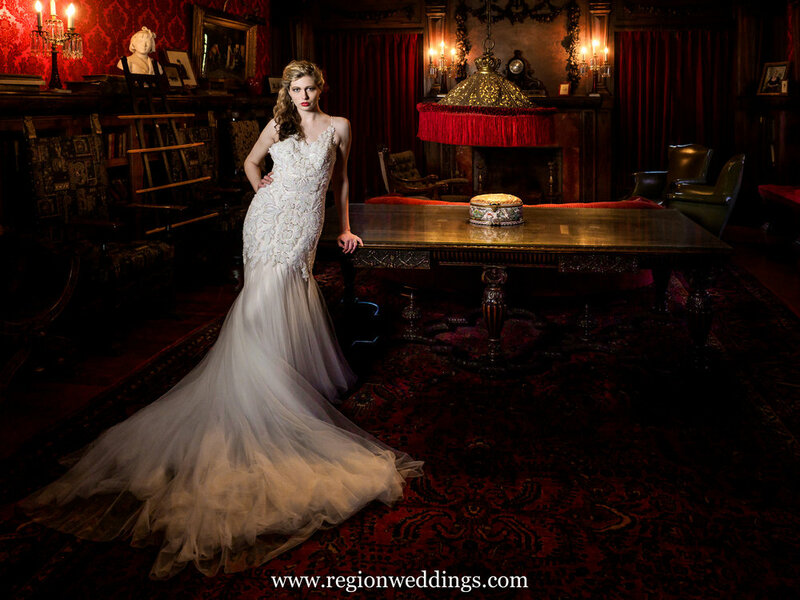 Bride inside the "red room" at Barker Mansion.